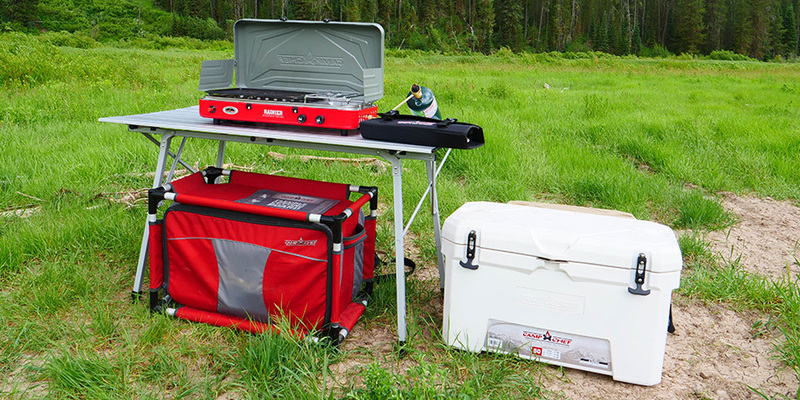 Getting the most from your Camp Chef cooler is a must. What you don’t want to have happen is be two days in to your trip and have warm drinks and spoiled food. These tips will help prevent both and make your trip a bit more worry-free and enjoyable. • Drop the temp – The night before you roll out, drop a bag of ice in your cooler. This will drop the internal temperature of your cooler and help keep things cool. • Pack smart – If you can, having two coolers is ideal. One for drinks that will be opened more often and one for food that will stay closed most of the time. Doing this will help ensure the important stuff, food, stays cool and doesn’t spoil. • Chronological order – Try to pack things in such a way so that the food you use the soonest is on top. This will help keep you from spending more time with the cooler lid open digging around for what you need. • Block vs. cubed – There are pro’s and con’s to block and cubed ice. Block ice, though bulkier, melts slower. Cubed ice will cool items faster, but they melt faster. A mix of both is ideal to keep up your ice retention. • To drain or not to drain – There is no question here. Do not drain the cold water. It will help the ice retention of your remaining ice because it will be close to the same temp as your ice. • The sun is your enemy – When in the shade, ice retention is almost twice as long as when your cooler is in the sun. Try to keep your cooler shaded or, when traveling, pack blankets or sleeping bags around and over the cooler to keep it insulated.